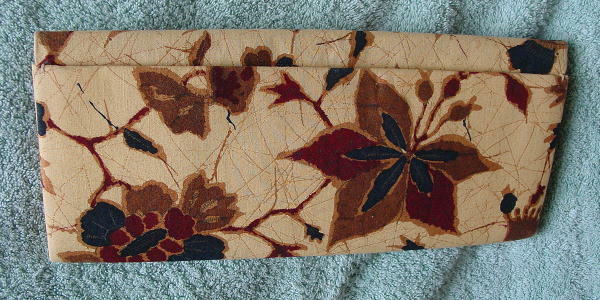 This vintage never-used fabric clutch has an envelope styling with a hidden front snap closure. The back has an open side to side lined compartment. 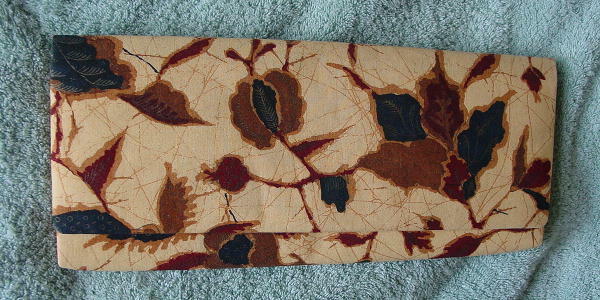 It has a creamy maize background with a line and leaf design in cocoa brown, chocolate brown, dark blue, and dark red-wine. The lining is in a tone-on-tone champagne color grosgrain-type fabric, which was popular in the '60s. It has a back zippered pocket and an open compartment in front of it. 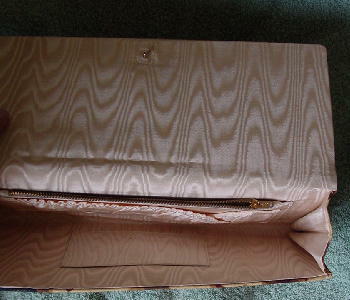 This open compartment has a loose elastic top. There is also a small open interior front pocket. It has nice soft fabric.